Oak Village Property Owners Association at Sugarmill Woods. 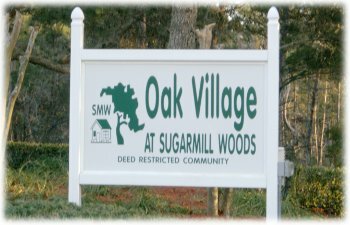 Oak Village of Sugarmill Woods is a Deed Restricted Community within the Sugarmill Woods (SMW) community. Oak Village is the second largest of the three major Deed Restricted Communities. The Oak Village Association membership consists of all parcel (undeveloped lot and developed lot) owners within the village. Membership in the Association is mandatory for all who own property in Oak Village. The Association membership elects a Board of Directors from its resident membership to legally govern the Oak Village Association. The duties and responsibilities of the Board are set by the governing documents. The Association can add, amend, or rescind any portion of the governing documents as long as such proposed changes fall within or are mandated by the legal guidelines established in the Florida Statutes for Homeowners Associations. Any proposed change must be submitted to the membership for a vote of approval according to voting procedures established within the existing documents. The Board of Directors consists of an Executive Team (President, Vice President, Secretary, and Treasurer) which are elected by the Board. Within the Board, there are a number of Committees such as the Architectural Control Board (ACB), Deed Restrictions Committee, Common Area Committee (Greenbelt), Security Committee, Finance / Budget Committee, Web Site Committee, etc. The Oak Village Board and its Committees are responsible for enforcement of deed restrictions, including architectural control. They are also responsible to preserve, protect, and maintain the Greenbelt common areas, provide and supervise nighttime security patrol, arrange supplementary mowing of the right-of-way, and maintain liaison with Citrus County agencies on issues affecting Oak Village. The Board meets monthly on the 3rd Monday of the month. The Annual Membership Meeting is held in September of each year. All meetings are open to the Association membership. The day to day operation of the Association is managed by Qualified Property Management and a Licensed Community Association Manager (LCAM) with Board oversight. Nola LeClair is the LCAM Manager and can be contacted via email at nola@qualifiedproperty.com. Theresa Matos is an Assistant to the Manager and can be contacted via email at theresa@qualifiedproperty.com. The Oak Village Association Office is open for Association Business Monday through Thursday from 9:00 AM to 5:00 PM and on Friday from 9:00 AM to 4:00 PM. For additional information concerning the Oak Village Association, please call their office at 621-8053 or visit their web site at www.oakvillageonline.com.